This year’s Silver Sunday was celebrated with over 140 older people, families, carers, stallholders and community members coming together in the Volunteer Hall in Duns to take part in the festivities. 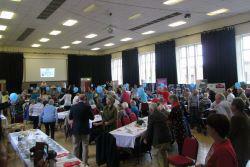 Silver Sunday is an annual event held throughout the UK for older adults. Led by the Sir Simon Milton Foundation, it is a chance to acknowledge the value and knowledge older residents contribute to their local communities as well as helping to address loneliness and isolation amongst the older population. This year’s celebrations took place on the last day of the Scottish Borders Health and Social Care Partnership’s Healthy Lives Week, being held to support the launch of the recently revised Strategic Plan. This also gave them the chance to find out more about what is available for them to take part in on a regular basis in their local communities. There was a chance to find out more about MOT 4 MEN, an innovative health self-management and screening programme that encourages men to think about their health in the same way that would maintain their car with the aim of getting them to look after themselves by having regular maintenance checks. “This is a great event and one that I look forward to every year now. It is vital that we take the time to acknowledge and highlight the significant contribution that older people make to our communities and Silver Sunday is the perfect opportunity for us to do just that. The Partnership’s Strategic Plan was published at the end of August – more information is available on our website. Information about Silver Sunday is available on their website.